I was never able to answer my friends whenever they ask me which is my favorite travel destination so far. I have never been to a place where I've gotten more in touch with nature. I was covered in dirt most of the time, yet I've never felt more comfortable and contented. 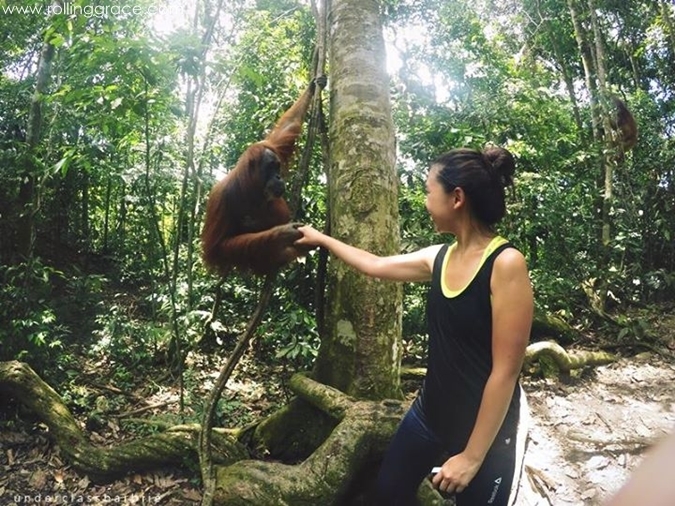 This was only possible in Bukit Lawang, the place with the best accommodation, atmosphere, and route for those who are planning to hike Gunung Leuser. The first thing that you will see once you get here is the exceedingly inviting river in beautiful emerald green. When crossing the bridge, you'll be immediately enticed by the sight of children frolicking on riverbanks, while mothers rest under wooden shacks while keeping a watchful eye on their children. Further away in the horizon are layers after layers of the greenest trees and shrubs. Then there is the blue, blue sky, dotted with beautiful pastel clouds. From Berastagi to Bukit Lawang through Terminal Pinang Baris. Takes about 5 hours and 50,000 IDR. Warning: The ride to Bukit Lawang is extremely rough and could cause nausea - imagine being in a ferry on choppy sea. Unfortunately, there isn't another way in. You'd need to take one of these (becak) in order to get from the Bukit Lawang station to the final destination. Once there, you will find a row of shops selling rocks, clothing, souvenirs, and local Indonesian food. This is how my everyday meal looks like. Simple, cheap, and yummy! Immediately after checking in, I made arrangement for tubing, which included a short one-hour hike in order to get to the upper stream. Video will be uploaded soon! Spent the evening chatting and watching the locals cook up a feast. The following day was even more exciting. Hiking Gunung Leuser was challenging, but very fun. To top it off, I got to see Orangutans, black gibbons, and adorable little Thomas Leaf monkeys. Shook hands with an Orangutan!